If you enjoy the idea of nostalgia but you don’t want to capitalise on the traditional wedding style for your invitations, you’ll find that the Pretty Nostalgic wedding invitation is going to be of interest. 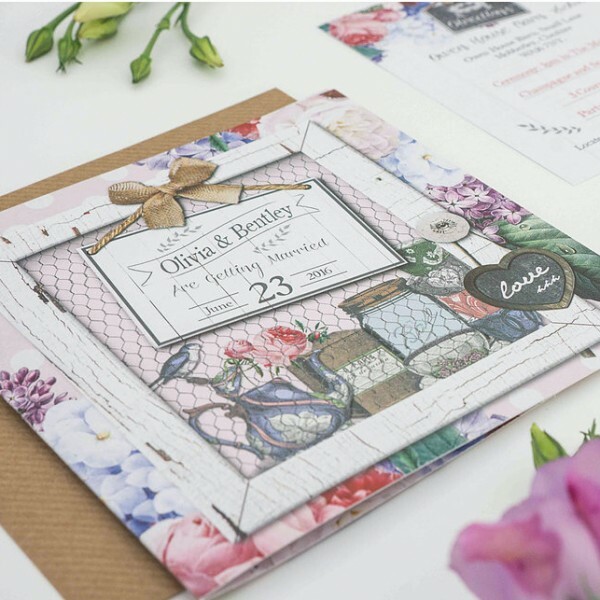 This is a wedding invitation that taps into a sense of old England and glorious summers, all of which will ensure that your guests are in a positive frame of mind when it comes to receiving this invitation. There is an English country garden vibe to these invitations and with lavenders and roses combining alongside English tea and cupcakes, there is a relaxed and pleasant atmosphere conjured up by these invitations. If you are looking to create a laid-back and joyful atmosphere for your big event, you’ll find that the Pretty Nostalgic wedding invitation achieves this without being too brash or making too many promises. It is an invitation that is completely unique but it isn’t one that tries too hard for recognition or demands to be noticed. If the bride and groom have a casual style and you want to ensure everyone is comfortable while looking forward to having a great time, this wedding invitation set conjures up the exact sort of mood and atmosphere that you want to create. As you would expect, the Pretty Nostalgic wedding invitation range comes with different stationery options and options for the big day, so no matter how consistent you want to be, this is the wedding invitation for you. If you are looking to tap into classic times, the Pretty Nostalgic wedding invitation from Hertas Creative Design will charm and delight all of your guests.